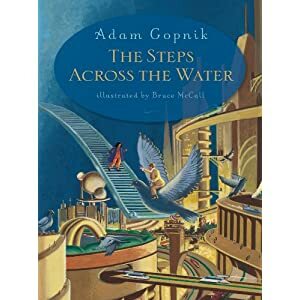 Then one day in Central Park, Rose sees something truly extraordinary: a crystal staircase rising out of the lake, and two small figures climbing the shimmering steps before vanishing like a mirage. Only it's wasn't a mirage. Rose is being watched--recruited--by representatives of U Nork, a hidden city far more spectacular than its sister city New York. In U Nork, Dirigibles and zeppelins skirt dazzling skyscrapers that would dwarf the Crysler building. Impeccably dressed U Norkers glide along the sidewalks in roller skates. Rose can hardly take it all in. This book is beautifully written. It's a heart-warming tale of Rose, a young girl caught up in a mystery, from the moment she sees a crystal staircase rising out of the lake. The book is reminiscent of the last book that I read by Adam "The King In The Window", which was equally as good. However, in this book the world of U Nork is a habitation of imaginable skill, it's so wonderfully detailed that you feel like you're in your own bubble, as you take a trip through familiar landmarks, but of course with a twist. It has a fairytale-like quality - in fact it's like wandering through an old classic book written by one of the great writers. However, the book also focuses on the darker elements, through the Ice Queen who sets out on a revenge mission to destroy the city. Whilst evil continues to play a significant role within the Sin Trail Park, which is actually based on Central Park. However, the book also has a wacky side to it through the character of Mr Murphy, who is a crazy person seeing the world through different eyes. This craziness is also developed through the city of U Nork, where the waiters fire meals directly into your mouth. These are fired across the street, from air pressured cannons, to the awaiting customer. However, the book also deals with serious issues - the feeling of being different. Rose and her brother having to save the world that they know little about and the issue of her being adopted, when she was just two years old. This book shows an inventive world that has been captured by a great talent. Adam tells such a great story that it will have everyone hooked. The beautiful illustrations created by Bruce McCall, capture and feed the imagination alongside the narrative. This sounds beautifully traditional - like a story I would have read in my childhood. Lovely review.